Here’s a quick Christmas card I made for a challenge to use new embellishments. I love how you can add just a few embellishments to a card to pull it together. This was so easy to make. 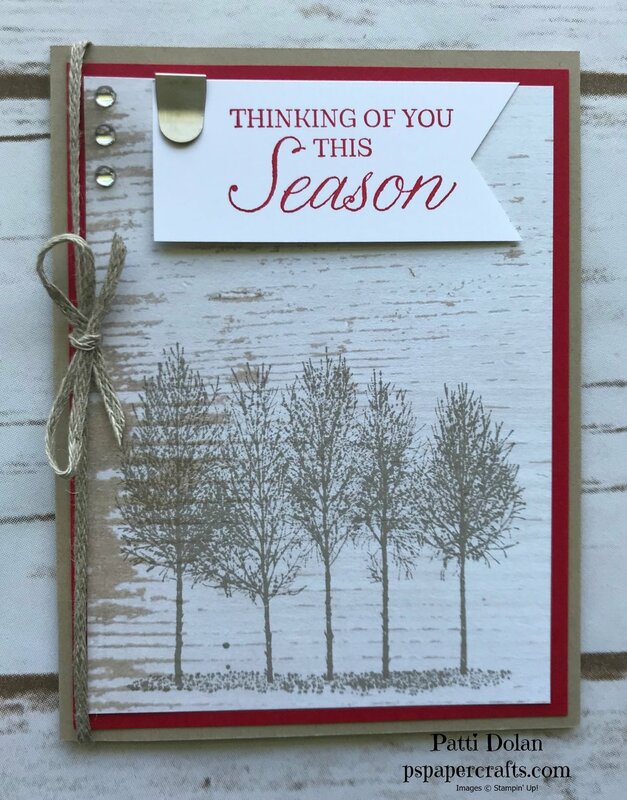 I stamped the trees from the Winter Woods Stamp Set in Gray Granite on a piece of 5 x 3 3/4 Wood Textures DSP. I layered that on a 5 1/4 x 4 piece of Real Red Cardstock and then layered that on the Crumb Cake card base. The sentiment was stamped in Real Red on a strip of Whisper White Cardstock and then I cut the end with the Banner Triple Punch. The Banner was clipped to the Wood Textures Layer using a Galvanized Clip and that layer was adhered to the Real Red layer and then to the card base. I tied a piece of Braided Linen Trim around the card and tied a bow. To finish it off, I added 3 Clear Epoxy Droplets.